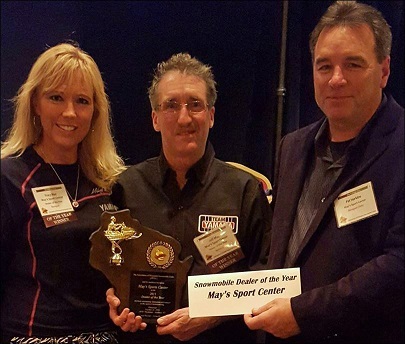 WE SERVICE ALL MAKES OF SNOWMOBILES, ATV'S,CYCLES,PWC'S(WAVERUNNERS), AND LAWN&GARDEN EQUIPMENT. YAMAHA HOT WINTER NIGHTS EVENT. 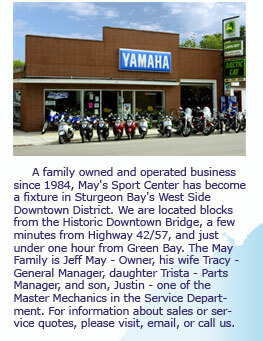 MARCH 26&27 2PM-6PM Refreshments,door prizes, see the new 2013 Vstar cycles. TRAIL REPORT LINKS ARE AT THE BOTTOM OF THIS PAGE. DNR SNOWMOBILE, ATV, AND BOAT REGISTRATION VALIDATION AND DECALS AVAILABLE. HOURS: 9am-6pm M-F, 9am-2pm Sat. LAWN MOWER & LAWN TRACTOR TUNE-UP SPECIAL is on now. Free pick up and delivery in the city of Sturgeon Bay. WE SERVICE ALL MAJOR BRANDS AND MAKES OF SNOWMOBILES, ATV'S,CYCLES,PWC'S(WAVERUNNERS), AND LAWN&GARDEN EQUIPMENT.WE NOW CARRY HUSQVARNA! CLICK ON THE LINK BELOW FOR DOOR COUNTY TRAIL REPORTS.